The manual work required to match trade data is still a pain point for settlement operations teams at capital markets firms. London, 1 May 2018 – The biggest changes in the global trade affirmation, confirmation, and allocation space since Aite Group last covered it in 2013 have happened within the vendor and “utility” provider community for electronic trade confirmation. In 2013, firms lacked certainty about which platform or technology the market would choose as a centralized “utility” for trade matching. In 2018, some of the contenders have exited the corral, others have entered the fray, and some of the fundamental dynamics have altered the defensive firepower of the incumbent gunslingers. This report examines industry perspectives on the vendors fighting for a share of the ETC flow. 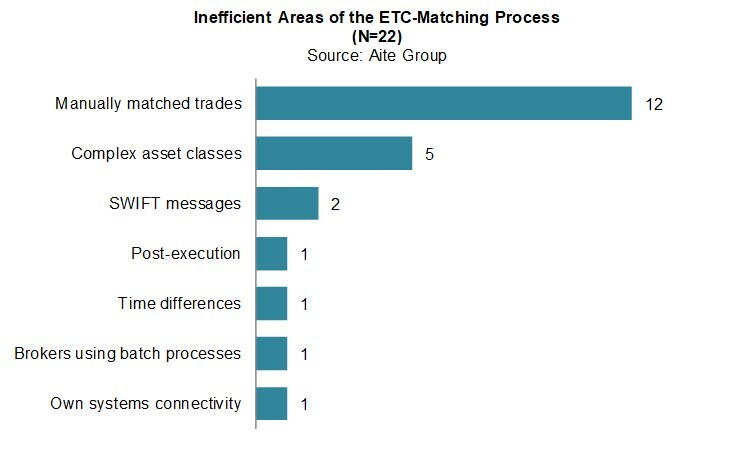 Based on telephone interviews conducted during 2017 with 22 market participants in settlement operations functions at global capital markets firms, it highlights common middle-office operational pain points, areas of automation, and common drivers for investment in this function for both buy-side and sell-side firms. This 38-page Impact Report contains 30 figures and one table. Clients of Aite Group’s Institutional Securities & Investments service can download this report, the corresponding charts, and the Executive Impact Deck. This report mentions Alpha Omega, Bloomberg, DTCC Omgeo, Fidessa, Finastra, FIS, ITG, Itiviti, Nex Group, SS&C, State Street, and Volante.